Lahaul-Spiti became the district of Himachal Pradesh in 1960 and is one of the frontier districts of India. It is 120 km. away from Manali and has snow fed glaciers and barren mountains. Keylong is the headquarter of Lahaul-Spiti and oasis of green fields. The two valleys at Lahaul and Spiti have a tenuous link over the Kunzam Pass ( 4,520 metres ). The two twin valleys, Lahaul and Spiti in the North-Eastern corner of Himachal, protected by distance is a region of nature at its wildest which has lent it much enchantment. The threshold of one of the Lahaul plateau is nourished by the Chandra and Bhaga rivers and is surrounded by high mountains on all sides, the Great Himalayas to the North, the Pir Panjal to the South and the Spiti and Chandra watershed to the East. Lahaul has curious mixture of Buddhist and Hinduism. There are a number of Monasteries and Temples. Location : Situated between 31°44'57'' and 32°59'57'' North Latitude and between 76°46'29'' and 78°41'34'' East Longitudes. To its North lies Jammu and Kashmir, to the East is Tibet, to South-East is Kullu and Kinnaur and to South-West and West is Chamba. Air : The sole access to Lahaul-Spiti lies over the 3,978 metres high Rohtang Pass. The high Rohtang Pass is at the top of the Kullu valley near Manali. Rail : The sole access to Lahaul-Spiti lies over the 3,978 metres high Rohtang Pass. The high Rohtang Pass is at the top of the Kullu valley near Manali. By Road : The sole access to Lahaul-Spiti lies over the 3,978 metres high Rohtang Pass. The high Rohtang Pass is at the top of the Kullu valley near Manali. Distance : Distance between Keylong and Manali is 115 km. And distance between Keylong and Shimla ( via Kunzum Pass ) is 610 km. Keylong :- ( 3,340 meters) located above Bhaga river, the district headquarters of Lahaul-Spiti has been described as oasis of green fields, willow planted water courses, brown hills and snowy peaks. In the past, Keylong was home of the Moravian missionaries. There well known monasteries, Tayul, Khardong, and Shashur are within a few kilometers radius. Khoksar :- ( 3,140 meters) a break and windswept place is the first village and gateway to Lahaul and on the right bank of the river Chandra 5 kms. from 'Gramphoo'. During winter Khoskar is the coldest inhabited place in Lahaul. The river freezes during winter and is covered with snow to afford regular passage for human beings and also for mule traffic. Khoksar is located on the old trade route from Indian plains to the west Asia. Tandi :- ( 2,573 meters) is situated at the confluence of Chamba and Bhaga rivers. A legend says that there were two lovers, 'Chandra', the daughter of the Moon and 'Bhaga', the son of the Sun god. To perform their eternal marriage, they dedicated to climb to the 'Baralacha La' and from there they ran in opposite directions. Chandra being active and smart, easily found her way down the pass and reached 'Tandi'. Soon Bhaga was found coming with great struggle through the narrow gorges to Tandi, where ultimately both met and the celestial marriage was performed. Tandi's importance for the people of Lahaul is same as it is 'Haridwar' for the Hindus. Gondhla :- ( 3,160 meters) is located on the river bank of the river Chandra. House of the thakur of Gondhla, called Gondhla castle or fort, is the main attraction. According to district gazetteer, this was built in 1700 A.D. by Raja od Kullu Man Singh whose influence stretched upto the Lingti Plains beyond the Baralacha-La. But present Thakur Fateh Chand says that it was 20 generations old. This is eight story building. Raja Man Singh of Kullu had stayed there in 1720 A.D. while on his way to Trilokinath Temple. Remains of the past are lying there. Age old costumes, furniture and idols are also strewn around in a state of neglect. The 'Sharab Raldi' i.e. 'Sword of Wisdom' given to the Thakur by Dalai Lama in the past is also there in the possession of present Thakur. This sword seems to have been built in the 'Toledo' technique of Spain. In the month of July a fair is held when Lamas dance and enjoy. This fair attracts a large number of visitors. Jispa :- It is in Lahaul valley, located on the bank of Bhaga river. There is a big camping ground. Sufficient trout fish is available in the river. Darcha :- (3,360 meters) It is in Lahaul valley from where trekkers start their trek to Padam via Singola as well as Barlacha/Phirtsela. Beyond this point there are hardly any trees. Yotche and Zanskar nallahs meet Bhaga river here from different directions. Baralacha La Pass :- (4,883 meters) It is in Lahaul valley, 73 kms. from Keylong. The name Baralacha means 'Pass with cross roads on summit' (Roads from Ladakh, Spiti and Lahaul join on the top of it). There is no road yet from Spiti, only a path exists. This pass is also an origin of Chandra, Bhaga and Yamuna rivers. They flow to three different directions, through the Chandra, Bhaga and Lingti valleys. Sarchu :- It is the last border point in Lahaul valley between Himachal Pradesh and Ladakh region of Jammu and Kashmir. Shansha :- It is situated on the right bank of river Chandra and Bhaga (chenab) in Lahaul valley. The 'Ghepan' a powerful deity of Lahaul is believed to be born there. A shrine dedicated to the deity has also been built in the village. Udaipur :- (2,743 meters) In olden times this village was known as 'Markul' and so the name of the local goddess is 'Markula Devi. Her temple is unique and is very famous for its wooden carvings on its roof and ceiling. This place is therefore a starting point for Mayur valley and further to Zanskar and other peaks. Kunzum Pass :- ( 4,590 metres ) As Rohtang pass is a gateway to Lahaul so Kunzum pass is the gateway to Spiti from Kulu & Lahaul. After crossing Rohtang pass and driving 20kms, one has to turn right from Gramphoo. While going to this pass, the panoramic view of Bara-Sigri glacier (second longest glacier in the world) is enthrilling and inspiring. The crest of the pass has been marked by a chorten of stones erected ages ago. Kaza :- (3,800 meters) It is sub-divisional headquarters of Spiti valley. It is situated at the foot of the steep ridges on the left bank of Spiti river. Once it was the headquarters of the 'Nano' the chief of Spiti. It is 425 kms. from Shimla. Tabo ( village and monastery ) : - At the right of Spiti river, is an ancient village named Tabo, flanked on either side by lofty brown hills and sun burnt, is the seat of one of the most famous Buddhist monasteries - Sherlang, Duang, Chamba, Chibbo, Domlang Gompas, regarded by many as only next to the Thelong Gompa in Tibet. The 10th Century Tabo monastery houses more than 60 lamas. Large number of scriptures and pieces of art, wall paintings - 'Tankhas' and 'Stucco'. 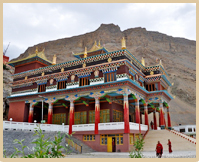 KI-Monastery :- It is the oldest and the biggest monastery of Spity dominating Ki-Village. About 300 lamas are receiving their religious training in its monastery, which houses rare paintings and beautiful scriptures of Buddha and other gods and goddesses. It is serving western population of Spity. Yang-Yud Gompa :- It is located near a narrow gorge of Kaza Nullah (1,300 feet high cliff) The head of the monastery - Lama is from Tibet. It is serving western part of Central Spity.